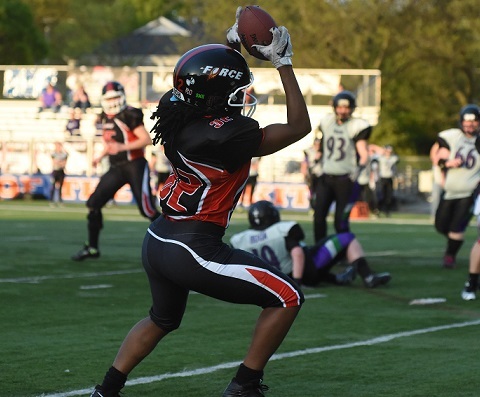 EVANSTON, IL: Picture perfect weather set the mood for an evening of winning football as the Chicago Force methodically dismantled the visiting Toledo Reign in a 52-0 blowout that was shortened by a running clock. The Force offense scored on 8 of its 10 possessions, punting just once and failing to convert on a field goal attempt when the snap was mishandled. Otherwise it was a touchdown parade for Force quarterback Sami Grisafe and her merry band of receivers. The Chicago offense, a victim of their own efficiency, were only on the field for 25 snaps, which equates to a score every third play. Grisafe threw for 301 yards and 6 touch downs on just 15 passing attempts. Tamika Robinson was named co-offensive player of the game for her 5 receptions for 110 yards and 2 TD's. Receiver Emma Vanderheyden had 2 TD's, as did Cassey Brick (one rushing, one receiving) and Jeanette Gray also had a receiving TD. 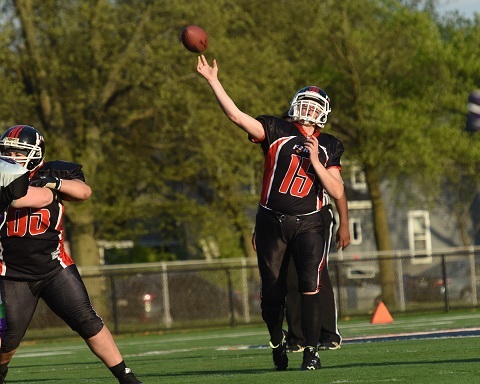 Kicker Jules Harshbarger was named co-winner of the offensive player of the game award for her booming kickoffs, seven perfect PAT's, and setting the franchise field goal record for the Force with a 43 yard field goal in the third quarter. Chicago's defense was tasked with defending a Toledo offense that relied almost exclusively on their grind-it- out running game. 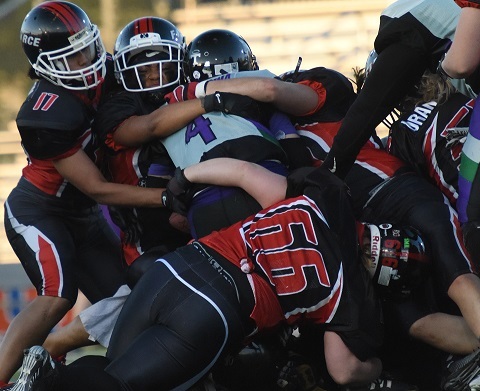 The Force defense held Toledo to 63 yards of total offense and defensive player of the game Sonja Drangsholt was a big reason for that with eight tackles, including 4 tackles for a loss. Angel Smith, Kelsey Casey and Mary Choules were also at the top of the tackle chart due to their active play. Head Coach John Konecki was mindful of getting maximum results out of the limited number of offensive plays, even opting to kick a field goal on first down so that his kicker would have an opportunity for a long range kick in a game situation. "Overall, I’m happy with the effort of the team. We all need to continue to take a critical look at our play and figure out ways to improve upon the successes we've had throughout the season." The Force are home again next Saturday 5/20 in the BIGGEST game of the season when the #1 ranked Boston Renegades come to town. This game has huge playoff implications as the winner will hold the top ranking and thus host each round of playoffs leading up to the championship. This is also Alumni Day and kickoff is at 6pm at Evanston Township High School.